Rebecca Underly is the owner of Del Ray Cakery, a home-based business that specializes in cake pops, decorative and wedding cakes, and other sweet treats. A mother of two young children as well, she uses her kitchen for her business and as the center of her family life. It’s a wonder that every surface isn’t covered in thin layer of sprinkles, flour, goldfish crackers and pretzels. Some days this may be the case, but Rebecca has found a way to use dozens and dozens of mason jars to manage her baking inventory and keep life running smoothly in the snack department as well. 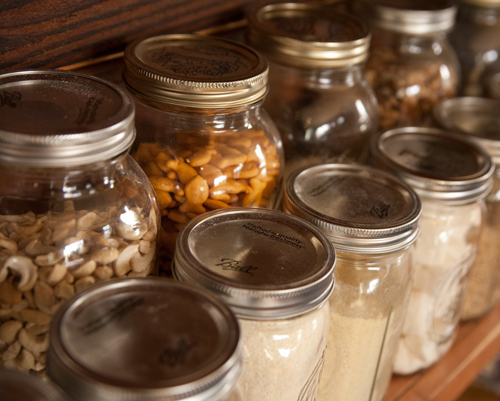 Behold her open pantry, a floor-to-ceiling set of neatly arranged mason jars. She marks the purchase dates of the dry good on the tops of jars containing bulk items. She follows a “first in, first out” motto. The newer items go in back so that the family will use up previously purchased items first. Rebecca likes that she lets nothing sit unused and forgotten. She keeps the sweet treats, like M&Ms and cookies, on the highest shelf to keep little people from helping themselves. The next shelf down has items she doesn’t use every day like dried beans, lentils, various grains, nuts and dried fruits. The next two shelves down have the jars with items the family uses almost every day like crackers, more dried fruits and veggies, pasta, protein powder, whey, oatmeal, ground flours for waffles and pancakes, and rice. 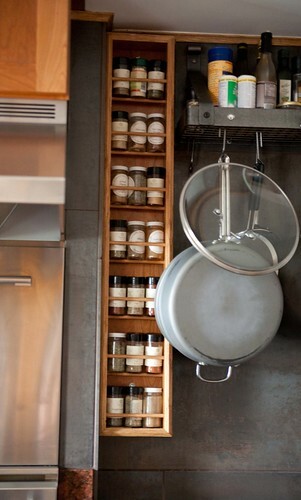 Rebecca’s floor-to-ceiling open shelving is one of the most attractive pantry storage solutions we’ve seen yet. And even if you don’t have enough room in your kitchen for a full pantry, here are a few examples of how local residents have embraced the open shelving concept. Love the article. Thank you for coming and seeing my storage! LOVE love love this! 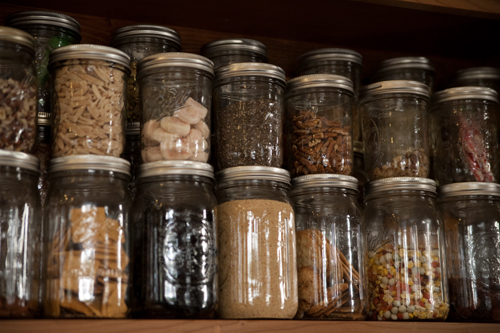 Question – do you mostly shop in bulk, or do you take everything out of its box and store bought jar and transfer? Some things I buy in bulk and others I take out of packaging and store in the jars. 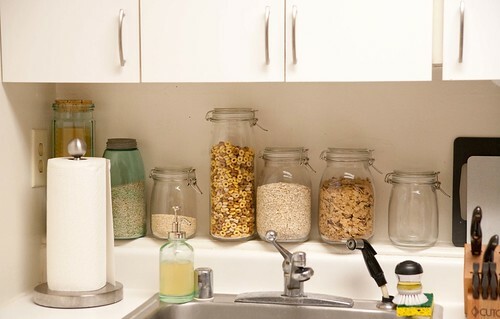 Great post and beautiful mason jar storage. Thanks for source info too. A few questions: Do Target brick-and-mortar stores tend to have mason jars? Or just online? Also, do you find you have a use for half-gallon size mason jars, or mostly just quart size? 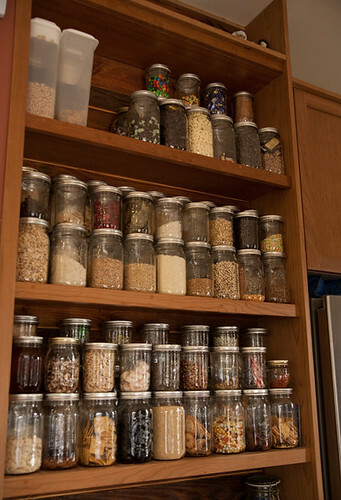 I’m a jar storage kind of person but am inspired to unify my system a bit, and wondering if purchasing half-gallon size jars would be helpful or not needed. Thank you! Target stores seem to have mason jars mostly during canning season. I have 3 rows of half gallon mason jars and they are useful for larger things like cookies, crackers, rice, large containers of oatmeal, etc. So having a few of those is really nice. I find them very useful. I have a very similar pantry. Floor to ceiling, make completely of butcher block (by my husband) and everything in mason jars. We do have a few items in larger glass jars like rock salt (we make our own ice cream), peanuts in the shell and noodles (we eat A LOT of them) and we have plastic containers for cereal. I have to say, I absolutely love the open pantry idea because it makes us more aware of expiration dates and it keeps things (like chips and crackers) from getting stale. The best place we found a good stock in mason jars is at Menard’s; especially the half gallon size. Menard’s? I would have never thought of that place. Half gallon is hard to find so THANKS for the heads up. 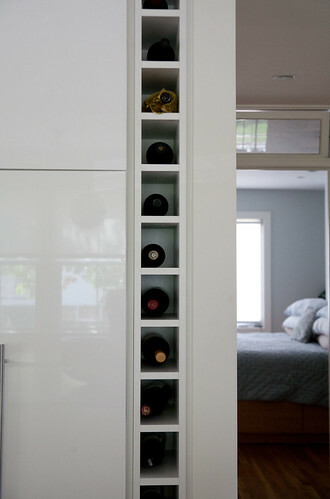 I would love to see what your pantry looks like. The open pantry is the best for knowing what you have and what you are out of. THanks again for the tip. Well done! FYI, Old Town Hardware also stocks the 1/2 gallon size. If not in stock, they can order for you and are very helpful. You can also purchase Foodsaver with mason jar attachment, and vacuum seal jars to prolong shelf life of items to keep from going stale. Especially whole grains, nuts, flours, etc. This is so awesome I’m going to start this immediately. Thanks for sharing this with us online..